- This issue was published as "two half-issues", one opposite the other. The cover shown here is of the A-side. 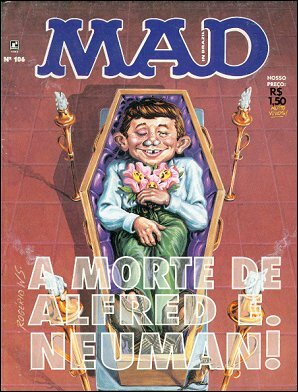 The cover of the B-side shows Alfred E. Neuman returning from a grave, and was also illustrated by Ofeliano. A ascensão de Titiro Dafirma Jr.
Teste MAD – Você É um Gourmet? OK, Você Cortou Fora! Agora, o que Fazer com Ele?